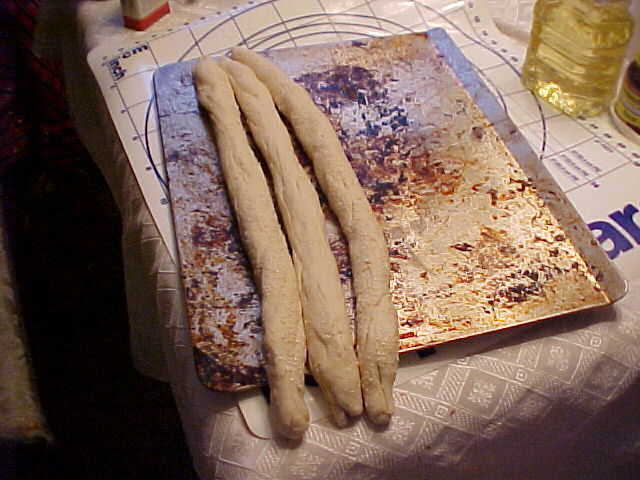 Bread making is great therapy -- with only time, a little effort and not much money, you can have something wonderful! 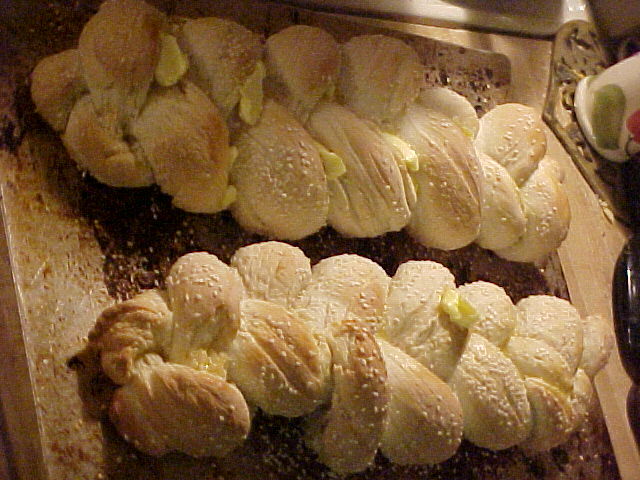 While all directions shown in the photos are for two loaves, it is easy to adapt this and make only one loaf at a time. 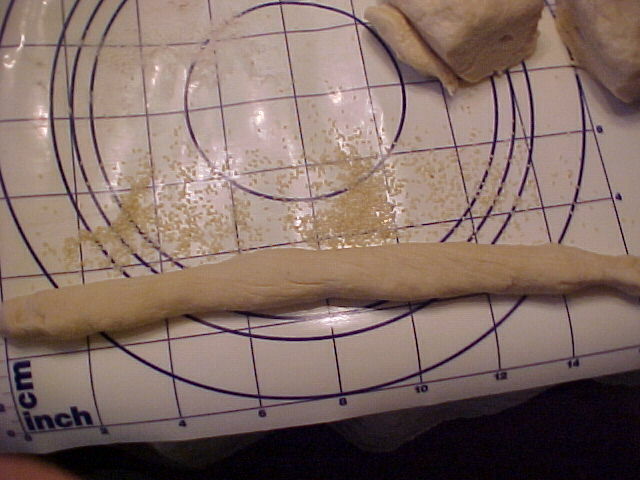 At the bottom, I have included the proportions to use for making one loaf of bread at a time. If you think you need a bread machine to make bread, guess what? All you need are a few simple ingredients, two hours of time -- most of which will be spent waiting for the bread to do its thing -- and a warm room. It's such an easy thing to do that you may find you like making it yourself better than making it from the bread machine! I make this bread so that I can have toast for my breakfast and it is a fine thing! 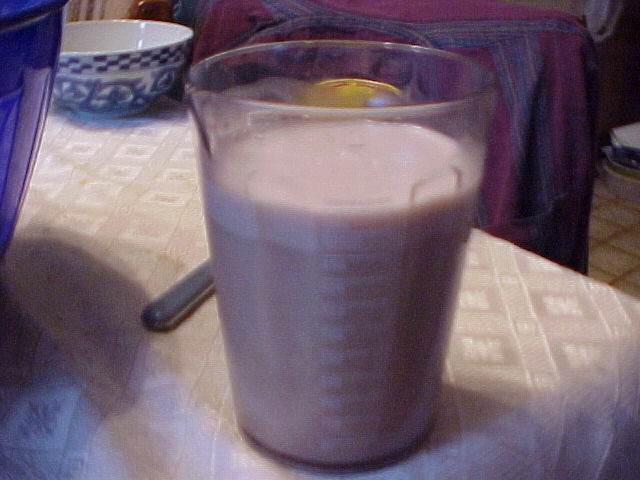 Measure out 2 cups of very hot (not scalding) water. There are people and recipes who will give you exact temperatures but I really think that's not necessary. You want nice hot water. It shouldn't be boiling and it shouldn't burn your hand or wrist if you stick your wrist under the tap. Stir either 2 envelopes or 1 Tbs. plus 1 tsp. of yeast into the hot water. 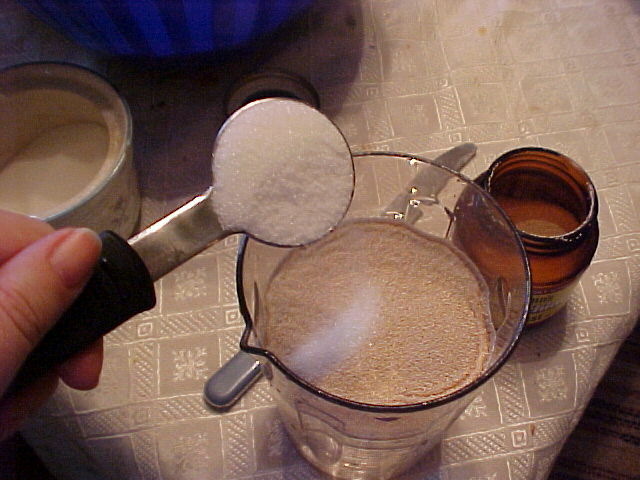 If your water was hot enough, you will be able to stir the yeast and sugar into the water and it will dissolve. Stir in 2 Tbs. of Sugar. This is a non-negotiable item. 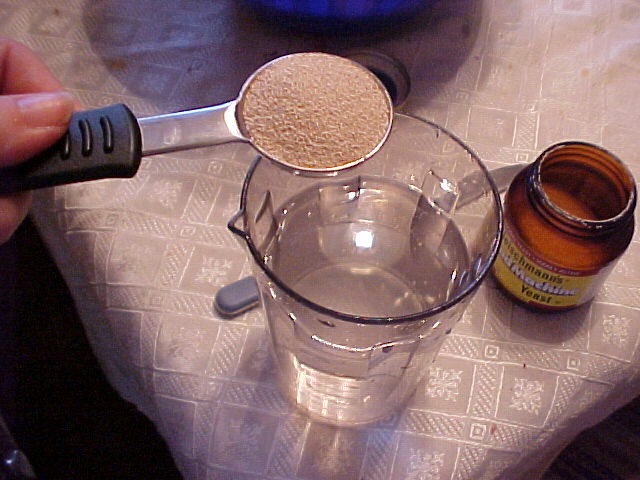 The yeast absolutely MUST have sugar to eat or it doesn't grow. You cannot substitute sweetener and your results will be unsatisfactory if you cut back on the amount of sugar. Feed your yeast so it will grow. 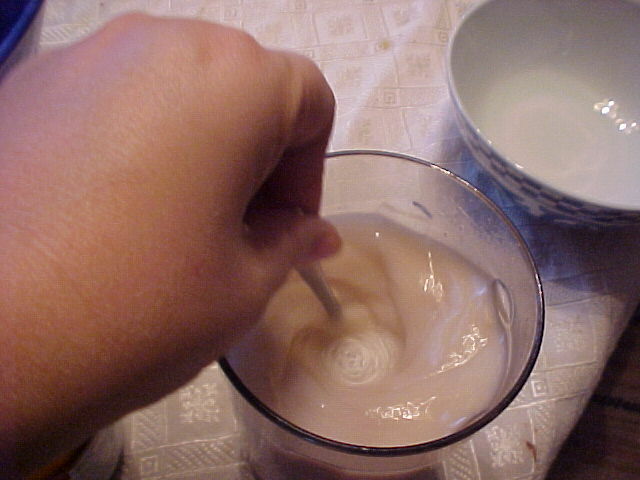 Stir the sugar and yeast into the water and make sure the yeast dissolves. Let it sit for about 5-10 minutes until it starts to be foamy. This is how it will start to look when the yeast is growing and becoming frothy. 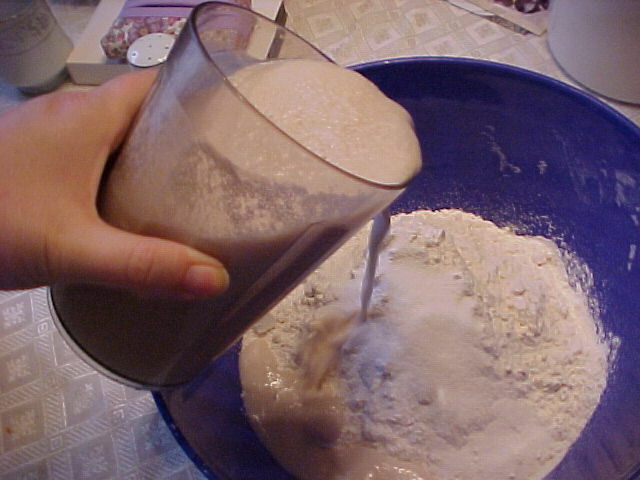 You'll stir this foamy yeast water into your 6 cups of All Purpose Flour and 1 TBS. of salt. 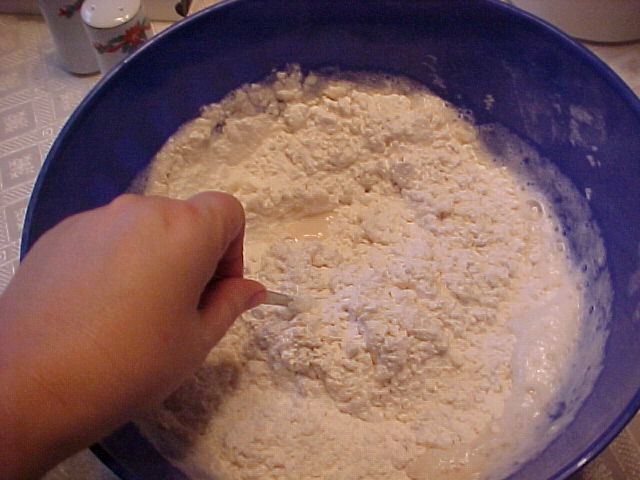 Stir the flour and yeast water together -- it will not be a really smooth batter -- it will be in clumps but stir it up as smooth as you can. 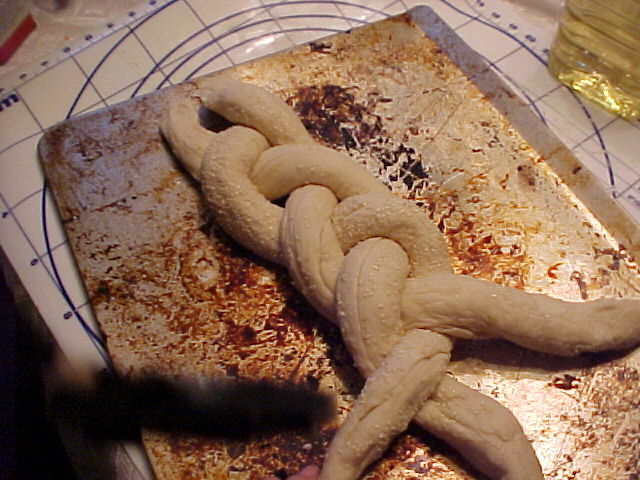 Once you get to where you can't stir it any more, take off your rings and knead it with your hands. 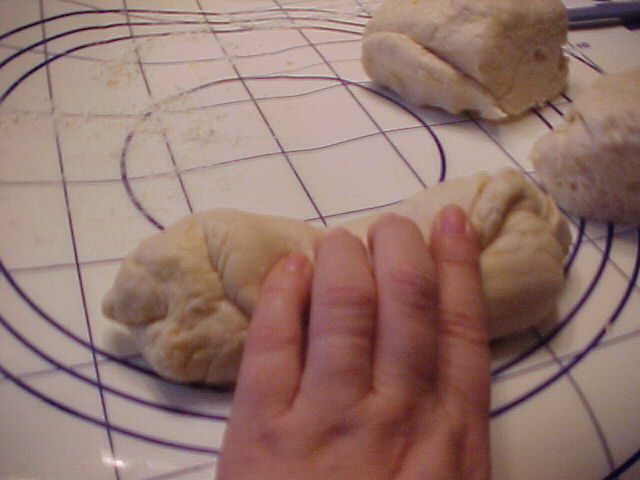 You'll want to fold it in half and knead it over and over till it's smooth, evenly mixed up and not as sticky. You may need to work a little flour into it to achieve this. 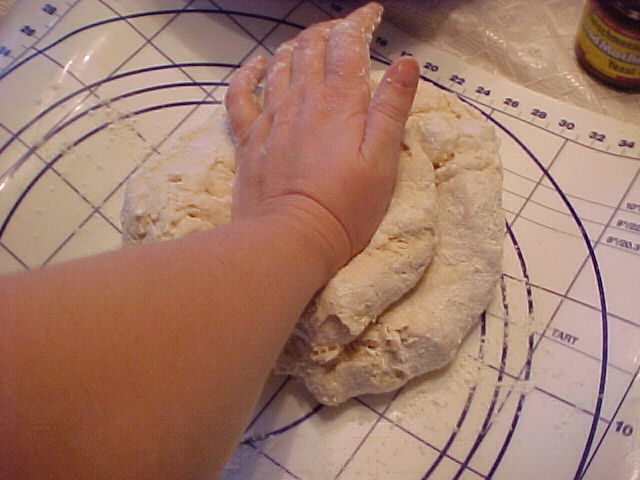 You will need to knead the bread to make it smooth textured. 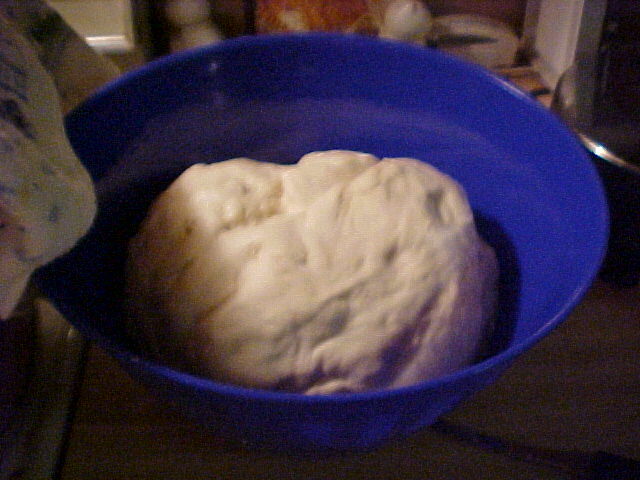 Either knead it with the heel of your hand on a floured surface or put half of it in the Cuisinart (or other food processor) and let it knead it for you. 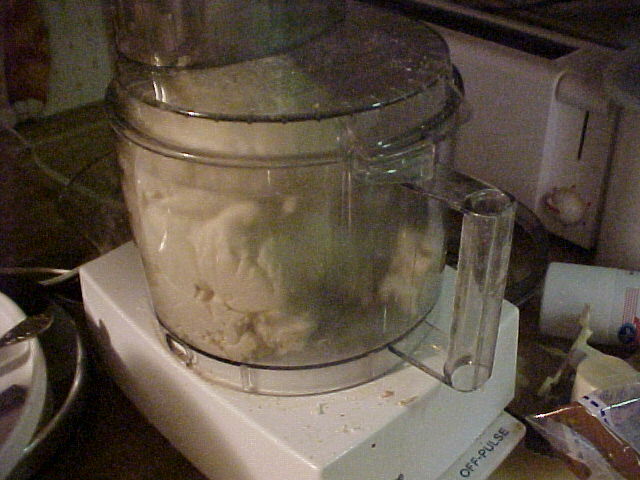 If you have a Cuisinart or other food processor, you may wish to use it to mix it, but bear in mind the full two loaf recipe makes about twice as much as will fit in the Cuisinart so you'll have to do it in two parts. 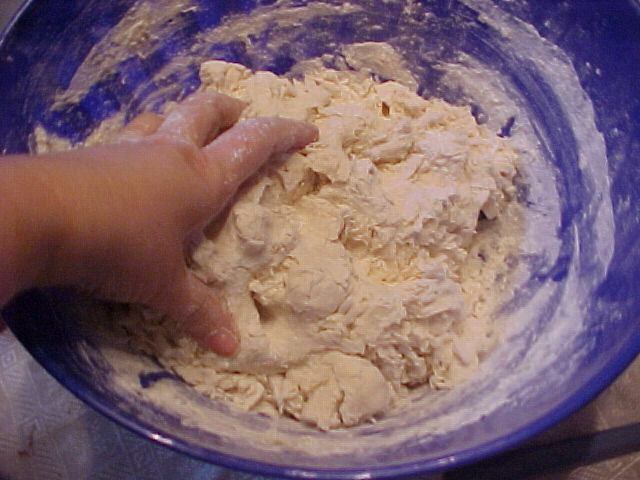 You'll know you're at the kneading stage in the Cuisinart if the dough seems to be "cleaning" the outer edges of the work bowl. It will almost be walking around the edges. Let it do this for a minute or two and then touch the dough. If it feels smooth and not too sticky, you're done. It will be somewhat elastic. If it is very tacky and sticky and you couldn't possibly remove it without it sticking all over your hands, sprinkle a tablespoon or so of flour on top of it and process another minute or so. And remember, while a food processor will quickly mix and knead the bread, you can always do it by hand just as well if you wish. You don't have to use a food processor at all! 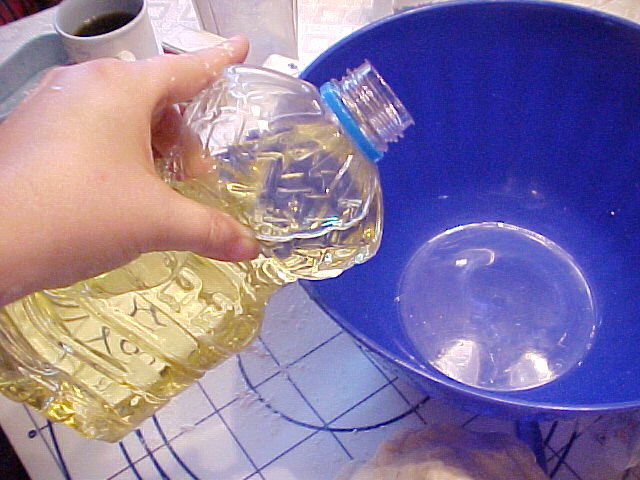 Add salad oil (about a tablespoon or two) to your bowl and spread it around, you may want to spread it evenly with a paper towel. 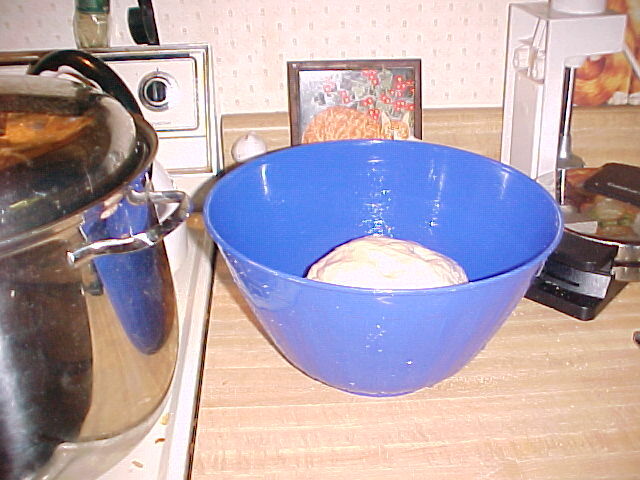 Place your bread dough in your oiled bowl and brush oil on the dough. 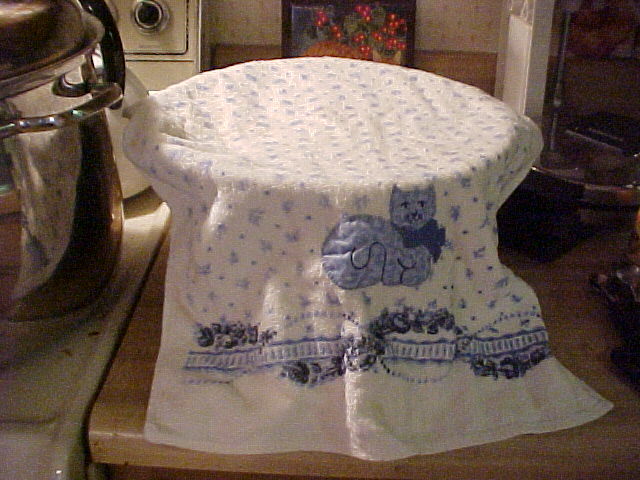 Set the bowl in a warm spot away from drafts and cover with a clean kitchen towel. Let it rise for about 45 minutes. In that time, it should just about double in size. 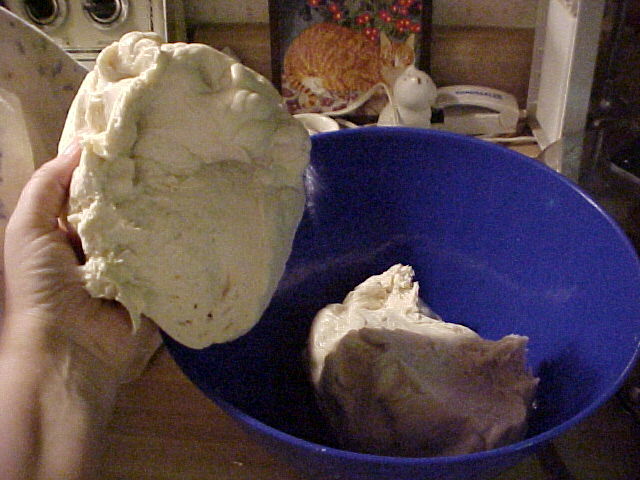 After 45 minutes, the dough will have doubled in size. We're making two loaves of bread so you will cut the dough in half and work with the one half now and then come back to the other half. 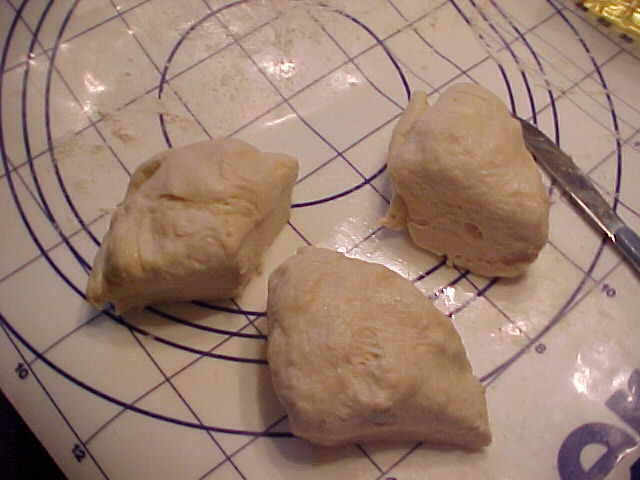 Cut your ball of dough into 3 equal portions. 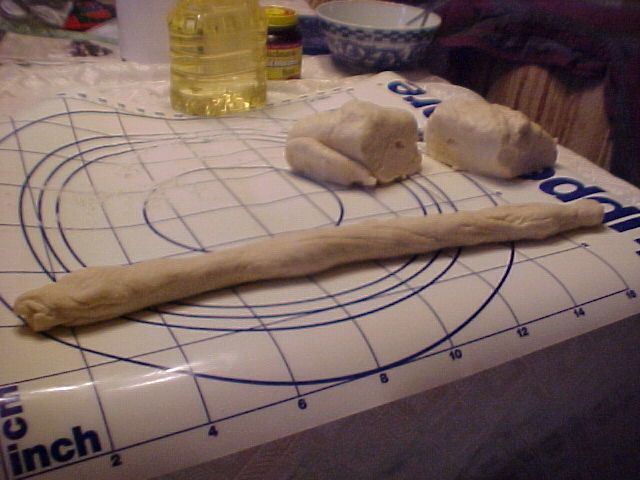 With each ball of dough, you'll roll it out with your hands into a long strand about 15-18 inches long. 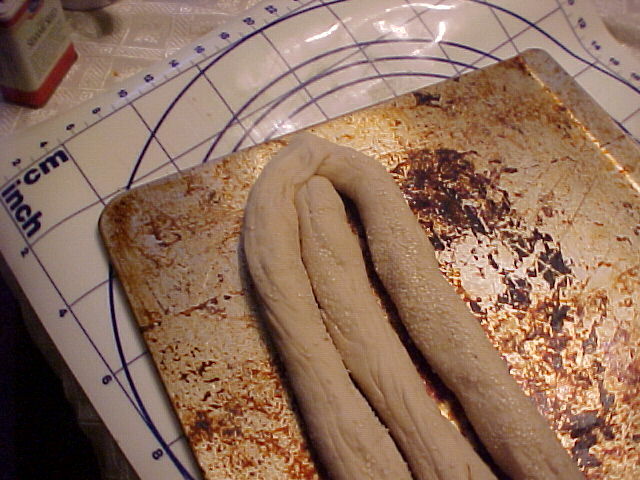 Here's what one of your bread dough strands will look like. Once you have your strand rolled out, scatter about a tablespoon of sesame seeds on your work surface and roll the strand into the seeds so it's coated. 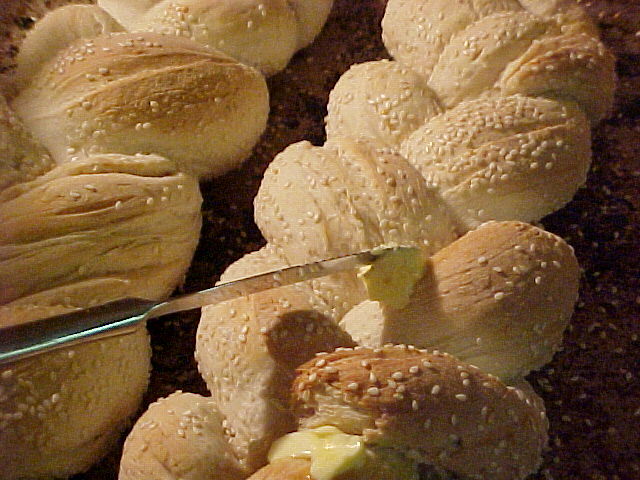 Place your three sesame seed coated bread strands on a baking sheet. Pinch the three ends together. Braid your strands together by shifting the center strand to the left, then the strand that's in the center at that point to the right, then the next one that's in the center to the left and so forth. 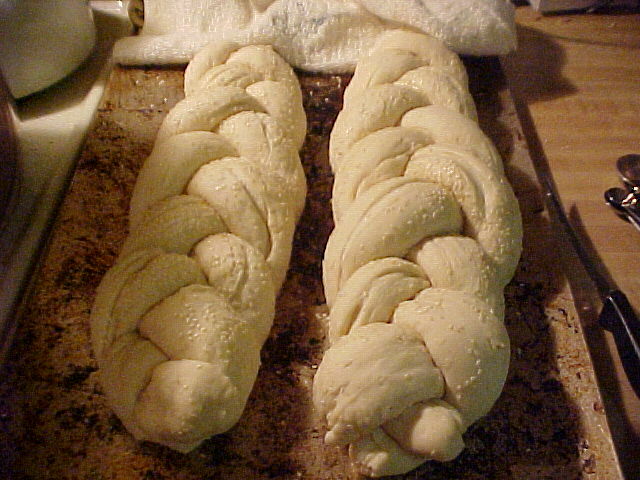 Braid the strands as tightly as possible. 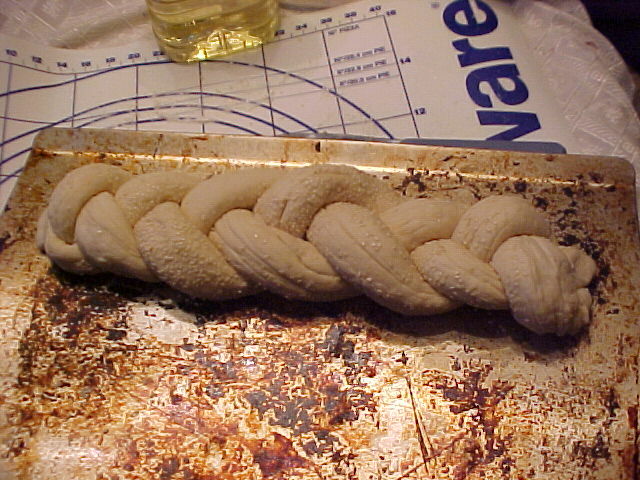 Here is your braided loaf. 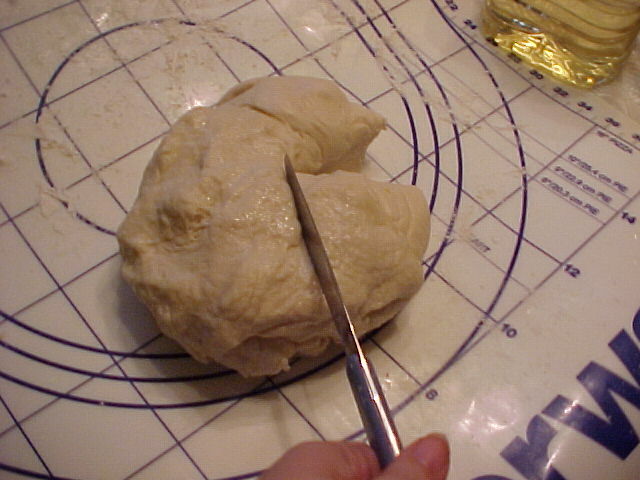 Take the second ball of dough, and repeat the directions above. 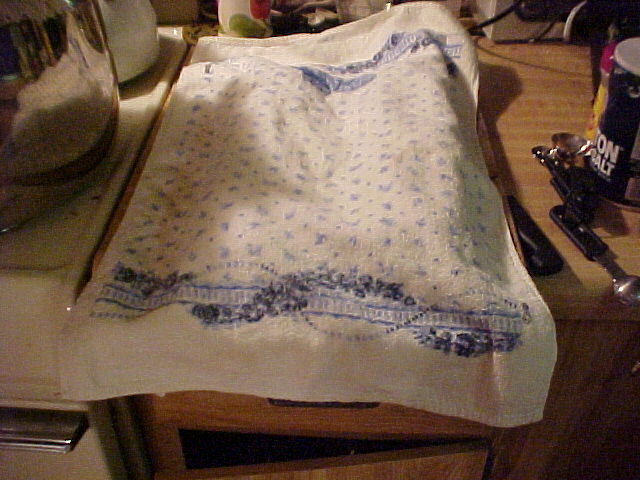 Take your two loaves and return them to your warm, draft-free spot and cover with your clean kitchen towel. Let them rise for 1 hour -- they will approximately double in size. You may wish to start preheating your oven at this point -- the heat from the oven may be handy to keep your loaves warm. After one hour uncover your loaves. 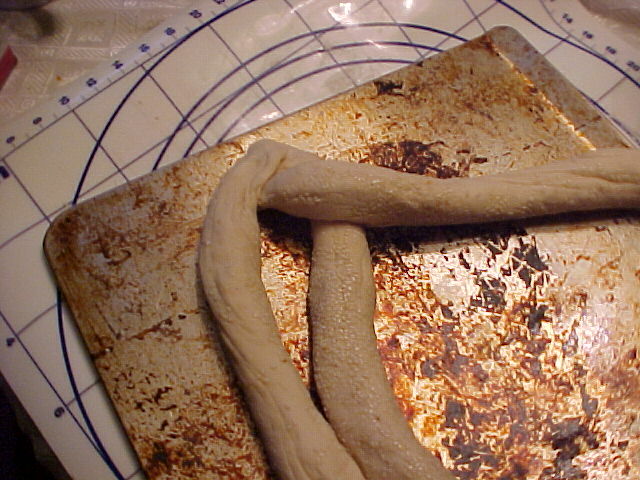 If they are double in size, place them (uncovered) in a 375 degree preheated oven for 25 min. or until golden browned. When bread is golden brown, remove from oven and dot with butter while still warm. The butter will melt into the bread and run down the sides nicely. Be sure to slice diagonally for larger slices. Makes WONDERFUL toast!